What makes Russia stake on tiny little-known states? Sovereignty trade is one of the few ways to earn for some countries. Russia, China and other countries play games to take advantage of it. Has Kiribati recognized Abkhazia and South Ossetia? The information to this regard was provided to Radio Australia on January 30 by Stephen Hodli, a foreign policy expert from the University of Auckland, New Zealand. According to him, in 2011, the Georgian Foreign Minister and Prime Minister asserted that "Russia pays Tuvalu, Kiribati and Vanuatu in exchange for the recognition of the breakaway provinces of Abkhazia and South Ossetia." He added that, to date, they were recognized only by five countries in the world besides Russia: Venezuela, Nicaragua, and now Vanuatu, Kiribati and Tuvalu. He did not answer the reporter's question as to how much Russia spent on the "assistance" to Kiribati. Hodli did not clarify when this recognition would happen. However, since the story of another diplomatic "victory" of Russia in the Pacific was published there has been no confirmation of this information. Hodli is a sufficiently authoritative expert, and his opinion cannot be ignored, although even the most eminent experts are wrong at times. The publication Georgia-online on October 3, 2011 expressed concern about the possible activity of Russia at "archipelago Kiribati located near Tuvalu." Vashadze (Minister of Foreign Affairs of Georgia) seemed to have had no communication with Kiribati about the "situation in the occupied territories." Moscow and Sukhumi certainly saw some hope in it. Apparently, if the recognition took place, it happened in the period from October 2011 to January 2012. There is nothing surprising about it. The country that could easily claim to be the longest of dwarf states on the planet, whose atolls are scattered over hundreds or thousands of kilometers across the Pacific Ocean, has no other choice but, like other countries in Oceania, trade its sovereignty. In addition, the terms of the economic situation, Kiribati, located at a distance from the world of communications, have no major natural resources and significantly lag behind many other countries in Oceania. The country is number eight out of 12 in terms of these indicators. The economy of this country does not grow much, while the population increases at a rate that would be envied even by some Muslim countries. While at first glance it is a small country (approximately 100 thousand people) the area suitable for human life is decreasing. Nearly all lands suitable for agriculture are freed from the natural vegetation. The situation is exacerbated by soil erosion caused by excessive stress from human activity and human waste clogging not only the land, but also adjacent to the area inhabited islands, and even groundwater. Apparently, for this reason agriculture over time will be increasingly less profitable. Sales quotas for fisheries, as experience shows, cannot meet all the needs. Sovereignty trade is one of the few ways to earn. In October of 2010 the country has recognized Kosovo, and, apparently, not without a reason. But far more revealing and instructive may be the way the country behaved in relation with China. Beijing took care of the new construction and modernization of old infrastructure facilities. It also gave an annual gift of two million Australian dollars in exchange for the placement of tracking stations for the missile tests (including defense) and satellites. In 2003, just a week before the commissioning of this facility to full capacity, Kiribati triggered a breakup with China, suddenly recognizing Taipei. Then Taiwan and China fought a fierce diplomatic war. While Taipei was making every effort to achieve its recognition in the diplomatic arena, Beijing was actively preventing it. One of the main battlefields was Oceania. Both competitors celebrating success in the area, and then would often be surprised to discover that they were deceived. 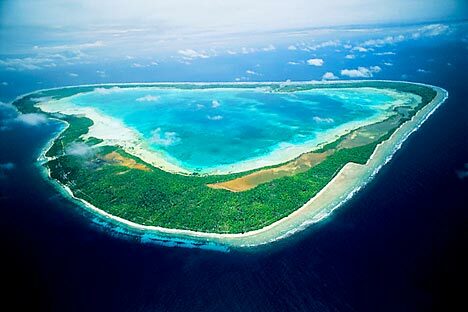 This was the case with Kiribati. However, the local political elite tried to shift the blame on the Chinese side that allegedly did not appreciate the desire of the Kiribati people to live in peace and friendship with all nations of the earth. This policy is continued by the Kiribati now. Kiribati seeks to please multiple countries - the United States, Britain, Australia, Germany, China, Taiwan, Cuba, and so on. It all depends on the amount of money they receive. Incidentally, the main reason why the Chinese tracking station has not taken root in this country was the fact that Taiwan offered more money than the country received from Beijing. Apparently, behind the backs of the comrades from China the Kiribati elite wisely agreed that the Taiwanese make up for all the losses from the cessation of Kiribati cooperation with Beijing. How else would one explain the fact that once the Chinese Communists offended by the frivolous Kiribati behavior were gone, Taiwan continued the construction of their national stadium with the price tag of eight million Australian dollars, and sent its doctors to replace those who left for Beijing? In this regard Kiribati's intent to play the "checkbook diplomacy" is not surprising. It would not be surprising if in the long run over time the Kiribati elite refuse the recognition previously made in favor of "good relations with Georgia." It all depends on how much the latter and its Western backers would be willing to donate to this cause. Most likely, they will not be cheap. Australians and New Zealanders are openly expressing their dissatisfaction with the increased activity of Russia in the region whose fate they were accustomed to administer. Moscow that rushed to the region in order to obtain the maximum amount of recognition for Abkhazia and South Ossetia should have thought before taking in tow the country that can at any moment decide that the Western context is closer to it than a distant relationship with Russia.